My mother always believed in me. The past few days I have been on a cabin-fever mission to clean out files. I have a lot of files. Today, contained in a file I labeled “bits and pieces” which I recall creating to store future writing ideas, I found a manila envelope with “Christine Writings” written on it in my mother’s handwriting. I wasn’t surprised. I knew my mother, who rarely saved anything sentimental, had saved some of the things I wrote when I was younger. There is a three-page handwritten essay on “Childcare and Babysitting.” I was probably in junior high. “When a girl gets to a certain age she needs more money of her own and needs more responsibility. Babysitting gives you both. It also gives you in a roundabout way lessons for homemaking and childcare. Although you have to know some basics and important facts before you start, each time in some way, a new experience occurs. There is a sheet torn from a school newsletter we put together in 8th grade. The type is a script and is purple. Remember the smell of mimeograph copies and how they were a little damp at first? I wrote a poem about the snowflakes. I remember sitting in science class beside the window, watching the snow fall and composing this poem in my head. I did a lot of day-dreaming in grade school. I probably should have been paying attention. I have a feeling I was writing about myself here. Then there is the short story, “The Power of Giving” that I wrote in December of 1971. I think I might have been a better fiction writer then than I am now. I knew how to write a hook in the first sentence. It’s a sentimental story, written in first person (I guess I liked first person even back then). A young girl gets in a car wreck right before Christmas and ends up in the hospital. She’s self-centered, and feels sorry for herself that she won’t be home for Christmas and throws a tantrum of major proportions. Later a little old lady named Auntie May visits her. They strike up a friendship and spend a lot of time talking. The girl knits Auntie May a scarf for Christmas. Auntie May has no home to go to and is headed to a nursing home. The narrator gives her the gift she made. “That was the first real Christmas I ever had,” the narrator says, “For that was the year I discovered the power of giving.” The teacher liked it. He asked me to read it out loud to the class and I couldn’t get through it without crying. That’s still true of some of my writing. My mom kept a poem I wrote in 1975 about our neighbor who was from Germany. I illustrated it with a drawing I made of the little old man with his cane, walking down a sidewalk under a big branching tree with bare limbs. Convincing me yet again, lest there be any doubt, to stick to writing and not drawing. His name was Mr. Gronauer and he did not speak English well. My dad used to go over and visit him from time to time to talk about Germany. One day my two sisters and I went over, maybe to give him and his wife Christmas cookies or something. They used to give us those gigantic Hershey’s chocolate bars. I’m not sure Hershey’s makes them anymore. On this particular occasion, they invited us in to have a seat on the sofa and they poured each of us a little glass, maybe about a shot, of liqueur. It might have been brandy. I took one sip and wondered how I was ever going to be able to drink it all. My oldest sister didn’t seem to be having any difficulty with it. I think Carol and I surreptitiously pawned ours off on her. I might still be sitting there today otherwise. Yes. My mom believed in me. When I’m doubting myself and wondering what to do next, my mom’s belief, in the form of a manila envelope, calls me forward, still. Three years ago today, I held my mother’s hand as she took her last breath. This is the post I wrote the day after. Today I am remembering a moment towards the end of her days when she was at Hospice. I never had a lot of time to have the heart-to-heart conversation with her that I yearned for. Things were moving too fast; I was too busy with Dad, and Mom was too sick. But on this afternoon, for the minutes she was awake, I leaned over her bed and said, “I’m going to have to find a way to talk to you.” She said, “Yes, you will.” Then I cried the tears I tried so hard to hide from her. She reached up with both of her arms and cupped my face between her two hands, giving me a lifetime of gratitude and love, a million words of goodbye, in one moment I will cherish forever. On Thursday night I heard my mother stir and I rose from my bed on the floor in the corner of her room and hurried to her side. “What’s wrong?” she asked as she roused from the deep sleep she had been in all day. In my mom’s 78 years on this planet, I imagine she heard and answered a lot of someones crying. In the 1950s through the 1970s she was raising five children who had been born within six years, including my sister Annie who was extremely disabled. I suspect there were a lot of times someone was crying. Why I like to iron, but don’t do it. I dress more for comfort than style, you might say. Unless you are my daughter, and then you might say that I never dress for style. But I maintain I do have a style, and it is called, comfort. One of the things I like about my particular style, is that it requires little to no ironing. Wash, dry, fold or hang-up and my clothes are ready to wear. There are one or two exceptions for special occasions, like Christmas. I wanted to wear a light-weight wool sweater today for the family party we are hosting. It is a rich cranberry color and mostly I save it for the holidays. I washed it, dried it flat, and it is not ready to wear. Iron on a warm setting, the tag informs me. So I pull my rickety ironing board out of the closet, unwrap the iron’s cord from the handy shelf/bracket I installed in my closet five years ago expressly for that purpose, and plug my iron in. My mother taught me how to iron. In fact, when I was young, I loved to iron. My mom would save my father’s hankies, and all the pillowcases for me to iron. In those days she didn’t have a steam iron. She dampened the things that needed to be ironed, which I suspect were most things in those days before the miracle of permanent press happened. Mom had a shaker bottle that she filled with water. She would lay the clothing or household article flat on the table or ironing board, and sprinkle it with water. Then she rolled it up and placed it on its end in the laundry basket to wait its turn. I can remember it as clear as if it happened yesterday. I would unroll the damp pillowcases and go to work on them with the iron, transforming the wrinkled and damp to dry and smooth. I folded the pillowcases as I worked. I folded each one into thirds lengthwise, making a long narrow, neat column that I would fold in half and again into fourths, pressing each section as I went and ending with a nice neat little square that stacked perfectly in the linen closet. I can’t remember the last time I ironed a pillowcase. I liked doing my dad’s hankies even more. They were quick and sweet and made a nice little square when folded in half eight times. I still have one of my dad’s hankies. I stuck it in my pocket when we cleaned out his room in the nursing home the night he died. I took it with me to the cemetery at his funeral where I dampened it with my own tears and pressed it between my fingers. Maybe I’d still enjoy ironing pillowcases and hankies today if I took the time to do it. Author CMSmithPosted on December 21, 2014 December 21, 2014 Categories Another perspective, Family, Mothers, NostalgiaTags memoir, Mothers17 Comments on Why I like to iron, but don’t do it. I wrote the post below a couple of months ago now. It has been patiently sitting in my post folder as a draft. I decided to go ahead and post it today even though it is dated. The eighteen-month anniversary of the passing of my parents has passed. And although I didn’t feel so just a few short weeks ago, I’ve begun to feel as if I have turned a corner. I feel like the fog is lifting and I am recognizing myself again, caring about things again, having more self-direction. I can’t promise this feeling will stick, but I am hopeful that the intense grief has passed and I am becoming accustomed to life without Mom and Dad. That being said, I woke up crying one day last week from a vivid memory of Mom. When I was attending college in my hometown, I lived on campus. My long-time, four-year boyfriend and I broke up and I was pretty torn up about it. I gathered my dirty laundry in the morning after a sleepless night. And as soon as I deemed it late enough to arrive, I drove over to my parents. My roommate had called my mom without my knowledge. When I got there, Mom was standing at the door, in her robe, waiting for me. This makes me cry again today just thinking about it. But what I realize today is that I may always have moments of tears about Mom and Dad. That’s okay. I suffered a loss. And the truth of the matter is that life will never be the same. It’s a new world. In a couple of weeks it will be the 18-month anniversary of my mother’s death. A year and a half. And the reason I’ve paid attention to that is that somewhere earlier out I Googled how long we grieve for a parent and I read somewhere that it’s different for everyone, but somewhere from 9 to 18 months is typical. I’m approaching the 18 month mark for my mom’s death. And two weeks after that, it will be 18 months since my father died. So I wonder again whether I grieve for them simultaneously or consecutively which would mean I get three years to grieve. Eighteen months. Is that all the time it’s been? it seems like forever. Most days I think I am doing quite well, but every now and then I have a bad day where I find my self sobbing, with a deep gut-wrenching pain that reminds me how much I miss her, him, them, and how I’ll never see them again. Am I getting through this okay? I wonder. My sisters are my reality check. “Me too. I’m not sure why, but I found myself crying again,” I say. Life does go on, but for me life will never be the same. Some things become less important, like finding the right window treatment for the dining room. And some things become more important like my personal relationships. I try harder to stop parenting in what can only be received as a judgmental way. And when I’m not able to hold my tongue, I find myself explaining my perspective and apologizing more. I try to nurture the sometimes fragile relationships I have with my siblings. And I make an effort to find ways to enrich my husband’s life. How I will be remembered is much more important to me. Being in control, having things my way, and being right don’t matter so much. I still continue to feel like an unmoored ship, directionless, no one behind the wheel. See more posts about my journey through grief. I have been spending most of my time the past several days updating the family history book I created for my mother in 1998. At that time I used the Family Tree Maker software book program. It’s a clunky program, on an older computer, and nobody else can open the files if I want to share the story. So I am moving the whole book, all 146 pages of it, into Word by copying, pasting, and updating information . When I have a good copy finished, I plan to post it on my Adams and Lemmon Genealogy site at WordPress. I have had some luck finding distant relatives who are researching the same lines as I am by posting stories about ancestors like the Mary Etta Conner Lemmon post from my Stitches we Leave Behind series. One of Mary Etta’s great-granddaughters, like myself, found the page and has been corresponding with me. This was much more exciting than it might sound to you because I now have a copy of my great-grandmother’s sugar cookies I wrote about in the post. A windfall as far as I am concerned. 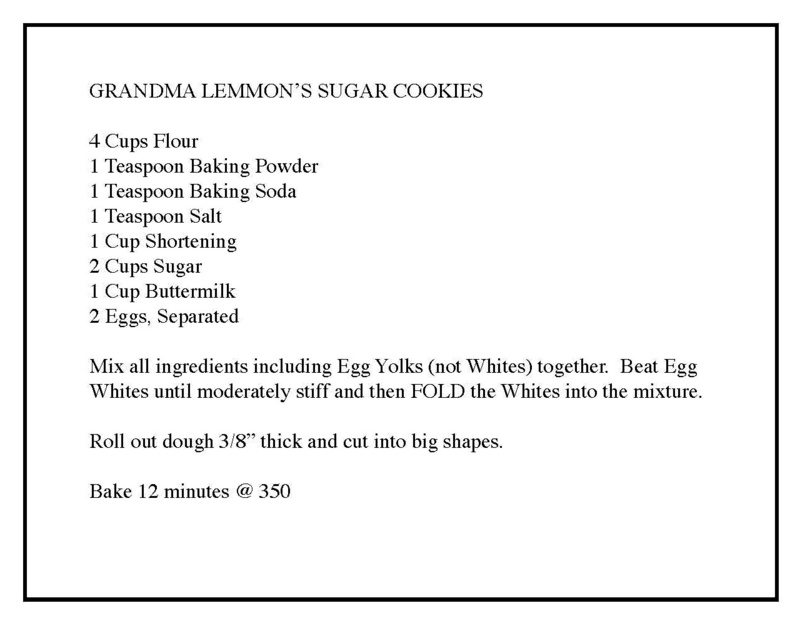 Although I searched and searched and tried out different recipes, I was never able to replicate those big soft cookies my great-grandmother used to make. I started researching my family history in 1983, shortly after our oldest son was born. I felt more connected to my roots with the arrival of our son. My father’s aunt, who was a Sister of Mercy, had started researching her family line, the Wirrigs. She gave me her research and I began. Over the years I have worked on our family history on and off again. When I first started, like most people at that time, I did not even own a computer. I kept records by hand, wrote letters for information, and visited cemeteries. Today a membership to Ancestry.com opens up the world for you. I also interviewed most of my elderly relatives. So many of these storytellers are no longer with us. I am grateful I took the time to talk to them while I still could. Stories of my grandmothers and grandfathers began to come to life on the paper and in my mind. I imagined what their lives might have been like. I began to feel affection for my ancestors. Today I updated my parents’ genealogies in their file on my computer by adding the dates of their deaths. It feels so final somehow. Mom and Dad have now joined the ranks of the mothers and fathers and grandparents who only live on in the stories on paper and in our minds. I feel a great affection for my ancestors. I realized two important things recently. When I visited Jeff Hillard’s Cincinnati Authors class to talk about Dancing in Heaven on May 1st, one of the adult or non-traditional students said, “My daughter’s friend has a sister who is disabled and in a wheel chair. I always felt a little sorry that my daughter’s friend wasn’t able to share the mother-daughter experiences that my daughter and I were able to share. Her mother was always too busy taking care of the disabled sister.” She made the comment to point out that Dancing in Heaven showed her another side, a different side, of having a disabled sibling or daughter. I smiled, but made no comment in reply, because she hit a very sensitive and very deep nail on the head. And I think that is one of the things I’ve grieved for with the loss of my mother the most—the hope I had, the possibility I had, of having some of those special moments with my mother. That’s one of the things I realized recently. And perhaps the word “realized” isn’t the best choice. I always knew that Mom wasn’t able to do the some of the things with me that my friends’ parents were able to do, or that I had wished she were able to do. “Faced my denial” might be more accurate. I remember only three shopping trips with my mother. One was to help her buy a dress to wear to my grandmother’s funeral in 1984. Another was to the drug store in 2012 so she could buy all the over-the-counter rememdies for her stomach pain that we all attributed to stress but was actually cancer. And a time when I was a young teenager that she wanted to walk to the grocery store, not thinking in advance that we’d have to bring all the groceries we bought back home. We weren’t able to carry them all between the two of us, so we decided to push the grocery cart filled with bags home. We hadn’t crossed the first street when Mom tipped the grocery cart over as she bumped it down the curb. The groceries spilled out into the street. I laughed so hard I was afraid I was going to wet my pants. I have often gone shopping with my daughter Anna. It is one of my favorite things to do. I went out to lunch with my mother once, I think, although I can’t really remember it well. Then my sister and I took her out to lunch for her last birthday in May of 2012. I remember that one a lot better. I have taken all my sons and my daughter out to lunch. You might say I even have a passion for creating those mother-daughter and even mother-son experiences. But while doing all this self-revelation recently, I can’t help but remember all the things my mother taught me. Or the things she made for me. Or how she patiently ripped out and fixed badly sewn or completely wrong seams in my fashion creations. Or the late-night conversations at her kitchen table on the overnight visits. Or how she was always there when I really needed her the most, if not in person, then certainly across the telephone wire. The time when she and Dad came to my dorm room with a computer when mine died the night before a test. Or when she and Dad came to my hospital room the day I had neck surgery, or the day I had Michael. Or the way she hand-wrung out the wet baby clothes in a washer full of water that wouldn’t drain when she came to help me at home. Some people have mothers who are alcoholics, or drug addicts, or too self-interested to bother. Some people have mothers who die young. Some have mothers who leave. No. My mother didn’t have a lot of time for lunches and shopping with me. But in every way that she could be, she was a mother to me. She was a very good mother to me. And I miss her so. If your mother is still with you, I hope you are able to enjoy her each and every day. If not, I hope you can remember her kindly for what she was able to give you under whatever circumstances or challenges she faced. And if you are a mother, I wish you a very Happy Mother’s Day. It always amazes me when I see something, learn something, understand something, only much later after the fact. It’s like the postcard from Peru I got this week from our new daughter-in-law. “Enjoying everything this beautiful country has to offer,” Cori wrote. “Can’t wait to share our travel stories.” Well, we already knew all that; heard the stories; saw the photos. Matthew and Cori went to Peru over three months ago in August. I don’t know where this little postcard has traveled since then—maybe it’s been riding along in the bottom of a mail carrier’s bag all this time. I’ve written about the last good day I had with my mom when I put up her little Christmas tree last year. What I may not have fully explained was that in the preceding days and even weeks, she and I had a somewhat adversarial relationship. She was determined to continue to care for Dad as she always had, but her strength and health were continuing to decline. I was trying to convince her to make some changes —add more home health aide coverage, get Dad an indwelling catheter so she wouldn’t have to do this tiring task three times a day, let Dad stay in his bed more, use the lift—because I was worried about both her and my dad. The last week of November I changed my approach. I threw in the towel. I told her I wasn’t going to try to solve her problems, but told her that when she was ready to make a change all she had to do was tell me and I would help her make it happen. So when she seemed different, more at peace, calmer, on that last Friday in November, I attributed it to my stepping back. In fact, I have remembered that day fondly—my mom sitting in her chair watching me decorate her house, being agreeable about it all, which frankly surprised me at the time. Last year when my sister called me a few days later, on the morning of that first Sunday in December, to say Mom was ready to get medical help and she wanted to go to the hospital, and I returned to their house, before we called 911 and started the sequence of events that led to her diagnosis of cancer, Mom told me something that came back to me this morning like a punch in the stomach. She had gotten cold feet about going to the hospital by the time I got there a half hour after the phone call. I was trying to convince her it was the right thing to do. I think she was afraid they would want to do tests and she wouldn’t want to be away from Dad that long. I think she was afraid she might find out something really bad was wrong with her. She was lying on the sofa and I was sitting on the edge beside her. I gave her the phone and was trying to convince her to dial 911. I was trying to reassure her by telling her it was probably nothing critical and that maybe she would finally be able to get some medicine that worked better than her pantry full of over-the-counter remedies she had been ingesting. “A couple of days ago, I found some lumps here in my stomach,” she said as she touched her hand to her belly. That sealed her fate, as far as I was concerned. There was no way I was not going to take her to a doctor somehow with that knowledge. She had wanted to go to the hospital. She had wanted to go in an ambulance because she wanted them to help her get there and get in. I called 911. What I realized this morning when I heard the words, “When someone finds a lump,” was that Mom had found a lump “a couple of days” before Sunday. She probably had already found those lumps when I was there on Friday playing Christmas music and putting up her Christmas tree. I think she knew. And I think she wanted to have a good day. No, even more, even harder to bear, is that I think she wanted me to have a good day. So I had a moment this morning. And I’m having another one as I try to relay this to you. Some days I really miss my mother. I love you all for the support and kind words you always have to share. Have you ever found something out or understood something long after the fact?